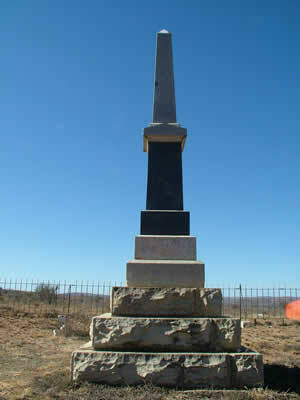 Although many of the frontier boere did not support or agree with the rebellion, some Voortrekkers have claimed that it was one of the reasons for the Great Trek. Colonel Jacob Glen Cuyler was an American by birth who had remained loyal to Britain during the rebellion of the American colonies. 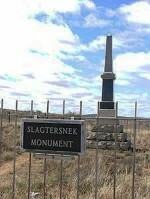 He had first hand experience of the harshness meted out to loyalists by the rebels and had consequently a strong aversion for rebels, unfortunately for the Slachter's Nek rebels. On 9th March 1916, exactly 100 years after the execution, a monument was unveiled on the spot where the hanging took place, on the N10 south of Cookhouse. 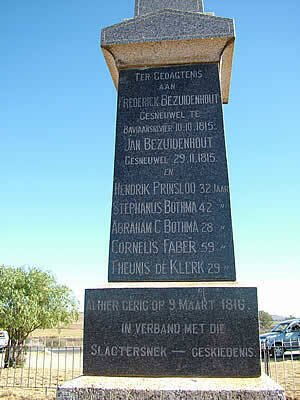 After 1806 the British authorities were determined to stamp out the lawlessness in the Eastern Districts of the Cape. Various strategies were implemented in order to bring the pioneer frontier farmers within the framework of regular government and the rule of law. 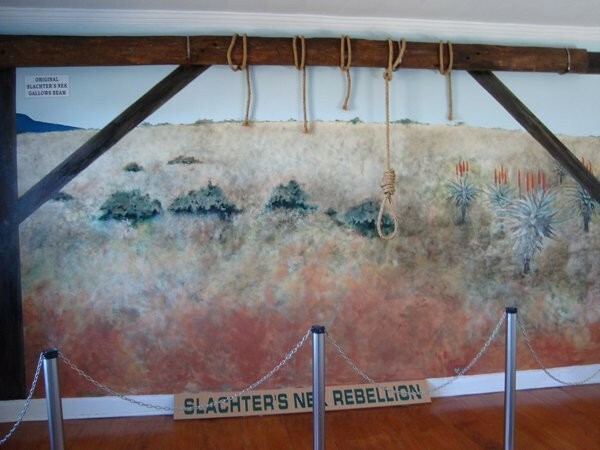 While some accepted the new changes, others in the more isolated and inhospitable areas remained suspicious of British motives and intentions....So begins the story of the 1815 Eastern Cape Rebellion, otherwise known as SLACHTER'S NEK. The exhibition strives to portray a glimpse into the lives of the ordinary people - the frontier Boers, Cape Regiment soldiers, Chief Ngqika and the British authorities - but it goes further. It explains how the Slachter's Nek executions moved people like Paul Kruger, DF Malan, CJ Langenhoven and Andre P Brink to contribute to the debate surrounding the aftermath of the event - in order to keep the memories of those involved alive. 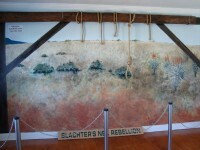 J.C. van der Walt's book, Rebels of Slagtersnek 1815, is available at the Somerset East Museum, and at the Walter Battiss Art Museum.